Today I am here to quickly introduce an online fashion portal that I have discovered recently. I hardly shop online. But when I do, it is with tried and tested websites like Jabong, Myntra, StalkBuyLove, etc. Though shopping online is very convenient, the restless person in me, hardly likes to browze through tonnes of pages to find a particular product. For example, if I want to buy a skirt,what will I do? I will log in to Jabong, browze through pages of skirts they have to offer, short list the ones I like and save them. Then I move on to Myntra, follow the same process, and then move on to my other fav online shopping sites. StyleBuys.com is not an online shopping website. It is a search engine for all things fashion. StyleBuys aggregates products from the most popular and trusted online shopping websites and displays them together for the convenience of buyers. So, now if I want to shop for a skirt, I don't have to login into multiple websites. All I have to do is log in to StyleBuys.com and search for skirts. It will display skirts available across all websites like Jabong, Myntra, Stalkbuylove, Amazon, Flipkart, Limeroad, Koovs, Faballey,etc. The list is almost endless. This way you get the best that various portals have to offer and then pick your favorite. This not only saves times, but is a lot more convenient. All you have to do is sign up with StyeBuys.com and start browzing for products you want to shop for. You will see products from different portals displayed at one place. Once you click on the product of your choice, you are redirected to the online portal selling that product. Place an order and you are done. I was looking for a red blazer for the longest time, and StyleBuys helped me to choose the blazer of my choice within minutes. I liked the experience so much, that I started browzing some more. And chanced upon these gorgeous colorful kurtis. 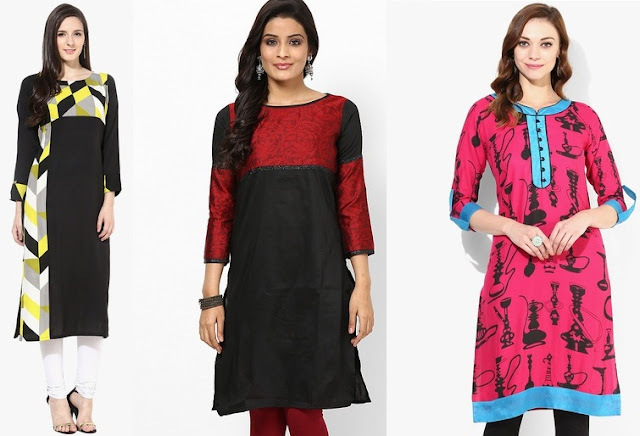 I have been trying to introduce some color in my majorly black and white wardrobe, and these kurtis just fit the bill completely. Minutes after I confirmed my order, I received an email from the affiliated website that my order was placed. I was really pleased with the shopping experience at StyleBuys, and would recommend everyone to try it atleast once. So what do you think of my purchases and have you checked out StyleBuys.com yet? P.S. This is a sponsored post, but the opinions expressed here are completely mine. This sure seems like a great app! Will surely try it out. This is great! You are right - online shopping can be time consuming when you want to comparison shopping. Yes, it's really convenient and time saving to buy apparels online. Thanks for the latest Update & Informations..